As I write this, I’m coming down off a major high. I’m sitting on an airplane on the way back home from the high desert miles outside of the beautiful town of Bend, Oregon. I’ve been out there all week at the Crimson Trace Midnight 3 Gun Invitational competition. Like last year, the event was held at the COSSA range which is located miles and miles from nowhere. This works out pretty well as neighbors in more populated areas might get a bit upset about hearing gunfire all night long for four straight nights. The event runs most of the week with two consecutive matches. Wednesday and Thursday, media members and the volunteer range officer staff shoot together. This allows the range staff to shoot the whole match, yet be available for dedicated range safety and logistics duties when the professionals shoot Friday and Saturday nights. All results from the two matches are consolidated into a single overall results tabulation, so everyone is eligible for the same prizes regardless of which nights they shoot. As the name implies, shooting doesn’t even start until it’s fully dark. 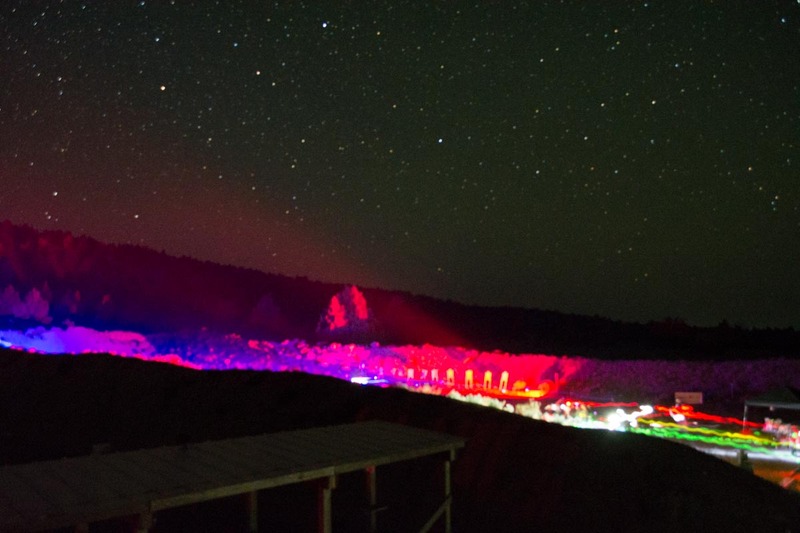 Competitors, range staff, media and visitors are all required to illuminate themselves with chemical glow sticks. One on the front and one on the back ensures that anyone still downrange from a target refresh will be clearly visible. As a result of the range staff’s care and attention to detail, the event boasts a perfect safety record. Lanny Barnes blasts a clay target with her Beretta 1301 Competition. Or is that Tracy's gun? As a media hack, I shot the Wednesday and Thursday match. One of my goals was to really kick the tires of the Beretta 1301 Tactical shotgun I’ve been evaluating. In my next article, I’ll go into detail about how I configured it for nighttime use, but for now, I’ll note the following. I chose the Tactical version even though there is a 1301 Competition model that offers competitive tweaks like higher shell capacity and larger loading port. The environment was great for really exercising a defensive shotgun - dirty, dusty and dark. Three of us shared the Beretta 1301 Tactical as wanted to run as much ammo through it as possible during the match. Since receiving the gun, I haven’t cleaned it, nor did I do any maintenance during the match. No matter, it ran like a champ with zero malfunctions of any kind. The super compact design of this gun made shooting and moving very easy. I chose to run first rate shotshells through the gun as a prize table was on the line. I used Federal Premium Gold Medal Target loads with 7 1/2 shot. I could stuff seven shells into the magazine tube plus one more in the chamber. More importantly, the 1 1/8 ounce shot load knocked down steel with authority. The pattern from the Beretta 1301 Tactical's cylinder bore was even and blew up the clay targets consistently. One of the benefits of shooting the pre-match was that I could focus on following the big shots during the main match. Big shots like Tracy and Lanny Barnes. You know them, right? Yeah, they are (now retired) Olympic biathletes, so they know a thing or two about shooting under stress and conditioning. You might also recognize the name as Tracy is a writer right here at Beretta USA. 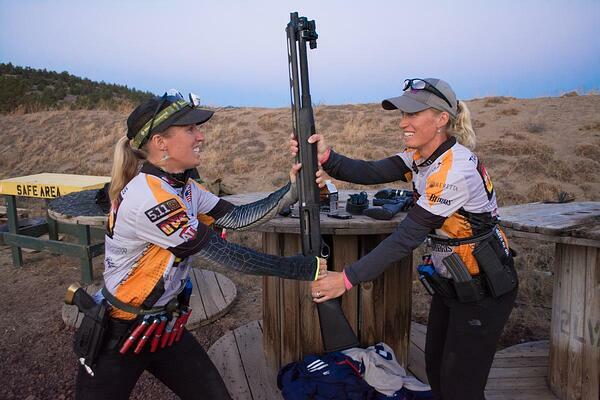 Tracy and Lanny both used the Beretta 1301 Competition shotguns. I'm convinced that my deliberate choice to use the 1301 Tactical, with its lower shell capacity, is the only possible explanation for Tracy and Lanny blowing right past my scores in the first few minutes of the competition. But let's move away from that topic. At least I got some great trigger time with my home defense gun. Talking to Tracy and Lanny after the first night of competition, I asked them about the configuration their Beretta 1301 Competition model. 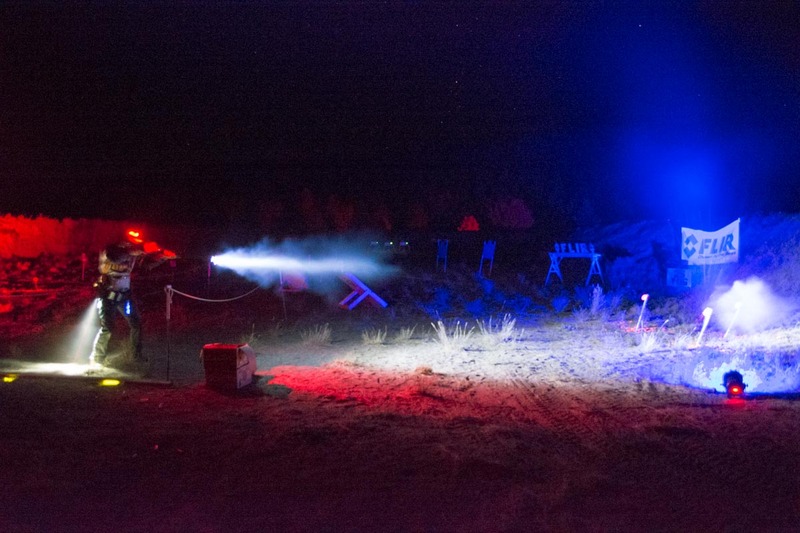 Although they each have their own 1301 Competition models, they chose to gear one up for nighttime use and share it, so their shotgun got quite a workout as well. Since this event is “open” class and you can do pretty much whatever you want to your guns, Tracy and Lanny added a Nordic Components magazine tube extension to bring their 1301 Competition shotgun to a total capacity of 9+1. They also added the Crimson Trace Rail Master Pro with 100 lumen light and integrated laser. While the event was more fun than should be legal, the learning epiphanies were incredible. In a future article here, I’ll share some of the enlightening lessons learned from shooting in the dark. Oh, in case you’re wondering, the U.S. Army Marksmanship Unit 3 Gun team dominated the competition, taking four of the top 5 places. AMU shooter Daniel Horner grabbed the $10,000 first prize. Lena Miculek took top honors for the ladies, while Brian Nelson garner the junior title.